1Open the Home tab on the Ribbon and then click the New Slide button in the Slides group to add a slide with the Title and Content layout. A new slide is created. 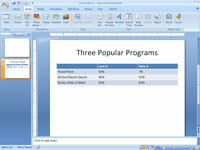 2Click the Table icon in the center of the Content placeholder. 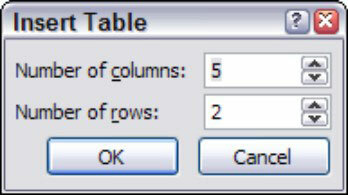 3Set the number of rows and columns table and then click OK.
4Type information into the table’s cells. 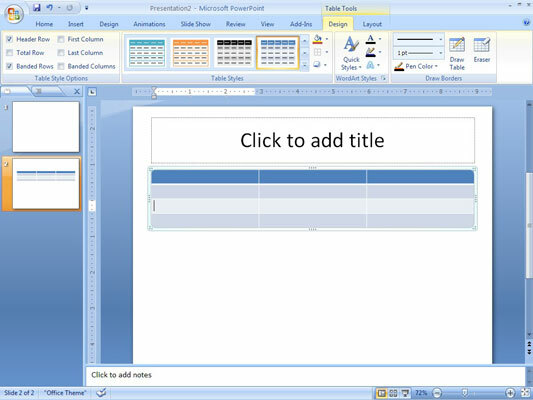 You can click any cell in the table and start typing. Or you can move from cell to cell by pressing the Tab key or the arrow keys. 5Play with the formatting if you want. Use Table Tools on the Ribbon to control the formatting for the table.